It's probably best if I start by outlining some of the things that went wrong on my holiday and why they sparked my anxiety and low mood. Firstly, I woke up at 3:45 on Saturday to drive to Liverpool to get the ferry. This was a bloody long day, that my body was not cut out for. The journey down was absolutely fine. I was obviously anxious about missing the ferry but it was okay, until the last 10 minutes. We were following our sat nav, we saw signs for ferry docks the other way but our sat nav didn't take us that way. Instead it took us further and further into Liverpool. At this point we were incredibly stressed as we thought we were lost but as we turned the corner there it was. The crossing was absolutely fine. When you get to the Isle of Man, you have to visit the welcome centre to get a disc for your car for car parking. My parents did that and left me in the car. What we didn't realise was that where we were parked was still in the port and once all the cars had alighted the security gates would shut. Being stuck in a car in a securely locked car park with your parents on the other side is not what I call fun. My anxiety was off the scale. Luckily the security man let my parents back in, and we went off to find the cottage. We found the cottage with relative ease, but as we were early, we decided to go and do some food shopping. My mum had researched the town we were staying in, and she said they had a Tesco. Now the Isle of Man is a very small island; they only have one chain supermarket in the capital on the other side of the island. At this point we were driving around and around, getting more and more stressed. Thankfully we found a supermarket; it wasn't what we wanted, but it would have to do. Also at this stage, we found out our sat nav does not like Isle of Man postcodes which through us off a bit. We hadn't even unpacked the suitcases because it was late. Instead, we put dinner on but because we hadn't unpacked the soap was still in the car. My anxiety was rising at this point, and I couldn't control my OCD. So I unpacked the whole of the car to find a bottle of soap. After dinner, I was so mentally exhausted. I had no interest in doing anything; I didn't want to talk to anyone. I just wanted to go to bed. The next day wasn't much better nor was Monday. We got very lost and stressed as we struggled to find our bearings. It was really hard for me being in such a new and unfamiliar environment. I cried a lot during this holiday because I really couldn't take much more. Tuesday was a good day; we didn't get lost or stressed. I was still upset in the morning, but I improved as the day went on. I thought things were starting to look up. They weren't. Mid week my mum came down with a heavy cold which sent my OCD into overdrive. I was even more anxious and scared about contamination and germs. On Wednesday evening I also had a bit of diarrhoea (which I know is like really TMI guys but it makes sense for me to tell you) basically because I have emetophobia and contamination OCD. I went into a full fledged panic mode. I was convinced that I had a tummy bug and that I was going to die and infect all those around me. This was when I sent the tweet 'I don't want to exist on this planet anymore' because I would rather die than be sick. I wasn't sick, I didn't have a tummy bug, once this had passed, I was feeling more positive. The reason why I have struggled so much this holiday is because one of my OCD compulsions at home is to pour neat bleach on my hands and leave it on for an hour or so. On holiday I didn't have any bleach and even if I did I couldn't use it because they don't have the right sewage system on the Isle of Man meaning that if you pour bleach down the sink, it messes up the system. The reason I haven't told you this before is because it's a horrible thing to do to yourself. It burns your skin. However, I can't stop doing it because it's the only thing that truly reduces my anxiety. It's like being an alcoholic or a drug addict. When you are stressed or anxious, you do what you know calms you down and gets rid of those feelings of stress and anxiety. It's the same for me and bleach. My OCD tells me that I won't be clean without bleach. The fact that I have gone seven days without bleach is a massive achievement. I'm so proud of myself! My week without bleach has taught me that I am strong although it's been hell and I can't go without my bleach when I get back home. I know that I can do it, and I can survive without it although at times I didn't think I could. Another positive thing to take from this week was the beautiful scenery. The Isle of Man is the most beautiful place I have ever been. Tomorrow there is a photo diary going up on my blog so you will be able to see just how beautiful it is for yourselves. Photography also placed a massive part in keeping me calm over my holiday and acting as an excellent distraction for me. The reason I wanted to do this post was to help reassure some of you who may be going through a similar thing right now or will experience something similar in the future. Even when you are on holiday, you are not immune from your mental health giving you a rough time. Holidays are supposed to be relaxing, fun and enjoyable but sometimes they are not and that's okay. I hope this post has helped you understand what I have been going through and has made everything a bit clearer. 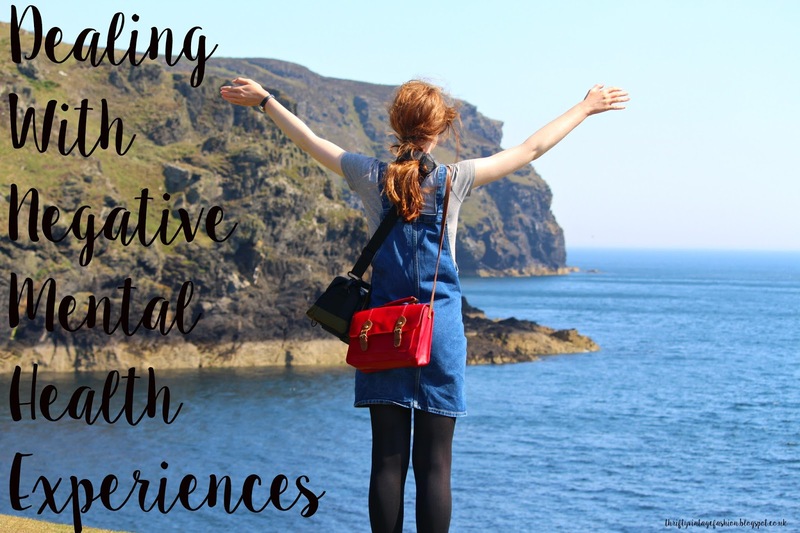 I wish I never had to write this post but as part of my recovery, I think it's important to document my ups and downs, to provide you with a realistic idea of what living with a mental illness is like. As the week went on I felt more positive and happier (probably because my holiday was coming to an end) LOL! I'm now home, and I can get back to my regular routine. Come back tomorrow for my Isle of Man photo diary! What a great read! I was diagnosed as a child and completely understand where you are coming from and reading this sent some rather *unpleasant* but vivid memories flying back. I hope everything goes okay and you look so gorgeous in these photos. I'm wearing a denim dress very similar now ahah! Wow! That just sounds like a roller coaster of a week! I'm glad you could see some of the positives that came out of it though - not needing your comfort of bleach for a week etc. I know someone who rolls up pieces of bread into balls as an escape from nerves and anxiety. Everyone has their own means of escapism. 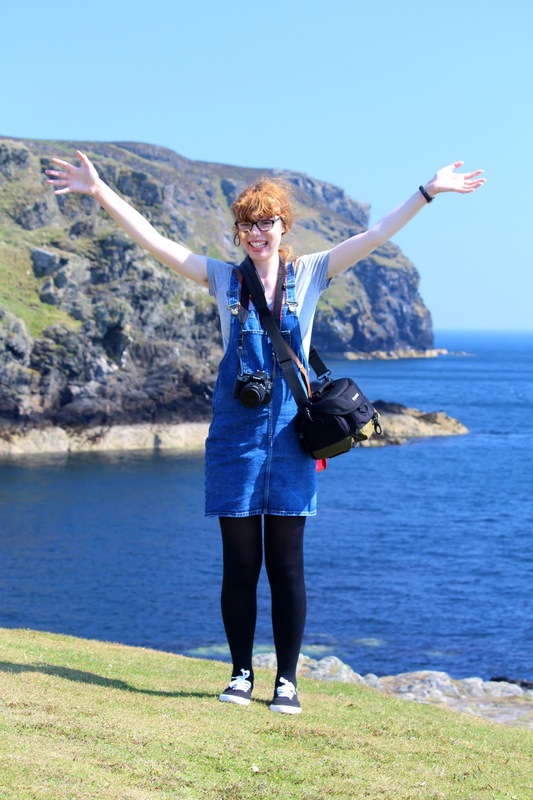 On a side note, I am loving your dungaree dress and I can't wait to see your photo diary! You are so open with your blog post and thats why I keep coming back :). Thank you so much for sharing this, I have had a history of depression I know how it feels to stick to one thing over and over again because it eases the pain. I recently wrote my mental health story on my blog so I know how difficult it is to really allow yourself to be transparent in order to relate to people. Wow, I'm so glad I read this. It's great that after all of it you're still able to find the positive points. Also great job on being bleach free for a week (That probably sounds odd, but I mean it in a good way). PS. Your red purse is the cutest!! I think it's so heartbreaking when anxiety, or any case of MH in that matter, takes something that's supposed to be a happy time and turns in into a nightmare. I'm currently sitting at home, instead of being at my internship, because I had two panic attacks before leaving the house. Now I'm scared I'll be stuck in this cycle, which is just stressing me out more. However, though I am so sorry to say you've had an awful time on holiday, I'm so glad to see you got through it! I also think it's very brave to describe exactly what you were going through. When I was on holiday last year, like you I had a bit of upset down there and I went into full on panic mode as well and refused to eat anything for at least 12 hours, just in case I was sick. Because like you said I'd rather die than be sick, as horrible as that statement is, its true so I 100% feel for you there lovely.